Sorry I have been a wee bit MIA lately. As you know we just got back from sunny Florida last Sunday and it has been a complete whirlwind since we arrived home. I hit the ground running in the beginning of this week and started to dump the kids "Play Room" which they have occupied for the last 8 years. This room is the real master bedroom of the house, but because it is the only bedroom on the first floor Mr. RL and I decided to be upstairs with the kids while they are still young. I suppose at some point when we feel that enough is enough and no longer want to be upstairs, the downstairs room will be our new master. And with that being said, I have the idea of an entire renovation involving taking the adjacent bathroom and office to create a huge master en-suite! But as of today this space will become a guest bedroom for my parents and sister when they visit. So what does a room look like where my kids have played for 8 years??? Sorry to say I am ashamed as well as embarrassed to admit it, but it looks pretty bad. No scratch that...it looks absolutely disgusting. Gross and filthy and full of "I don't know what" marks!! So many flipping dings and holes in the wall that it took two full days just to Spackle them in order to repair all 4 walls. Then I started to paint...I have two walls completely done and chose a paint color from Benjamin Moore's classic collection called Cool Mint. 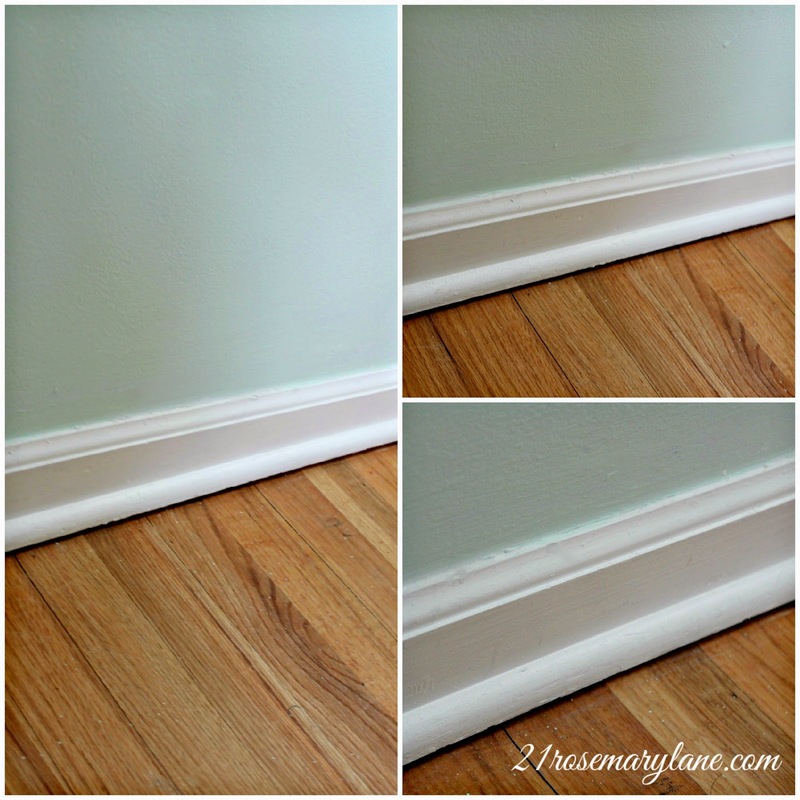 I am amazed at what some paint and little caulking can do to spruce up baseboard molding. The color is really pretty too. 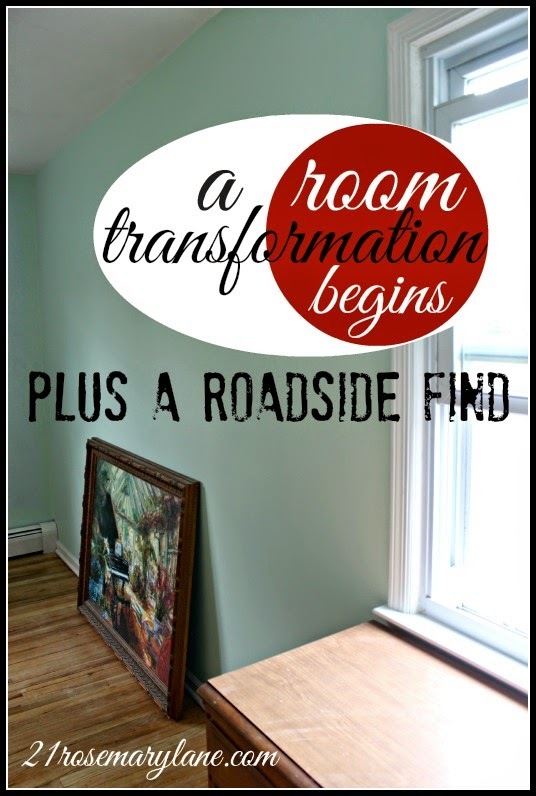 The plan is to take the room in and eclectic French Country direction. 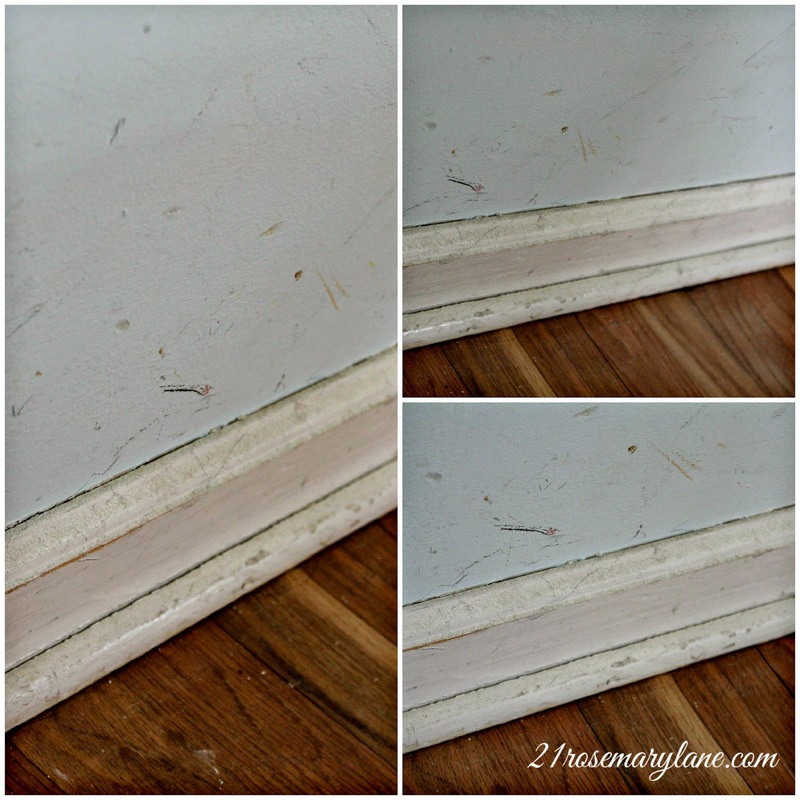 I'd like to buy new window treatments but nothing expensive. I want some roll shades and I am going to give the windows drop cloth drapes. I also have a dresser and mirror I bought a few years back at a yard sale sitting in the garage waiting for a little makeover before it makes its new home in the first floor bedroom. And I already have some pretty artwork that will work well with this paint color. 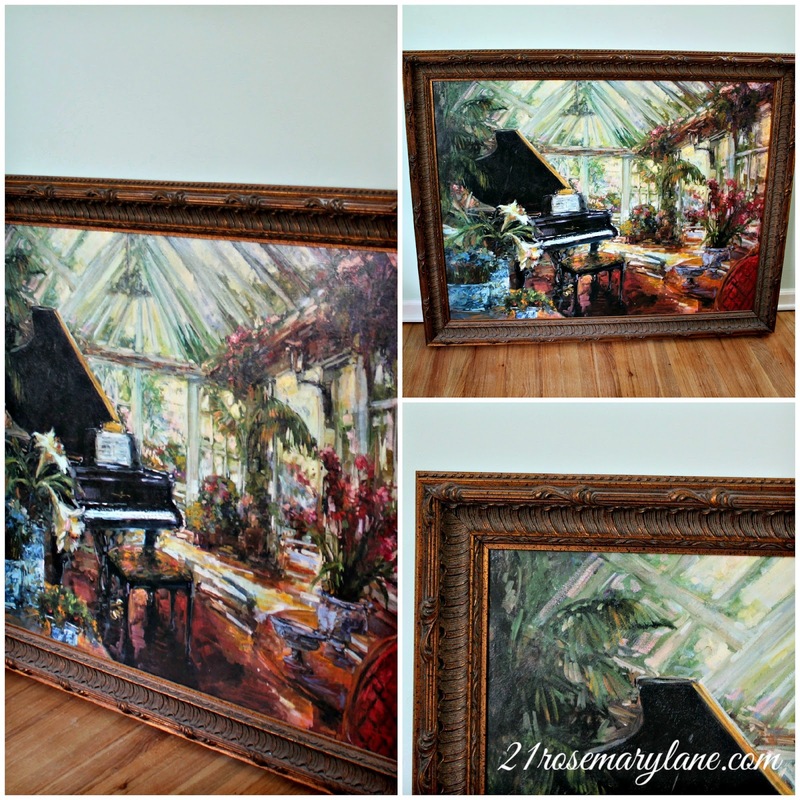 This picture originally hung in the dining room when it was red. I think the contrast will be pretty against the wall color which I realize looks different in almost every picture. Most likely this is due to the fact that the room has windows on two walls which lets in tons of sunlight. The next thing I am going to share with you is this roadside find from the other day. You see MR. RL started working from home 2 days a week, so this means we get to enjoy a nice 2 mile walk at lunchtime. So on Thursday we were walking and found this trunk next to the road with a FREE sign on it! Now I am not sure what I am going to do with it but it was simply too cool to pass up. I was thinking maybe a table can be made from it...what do you think? 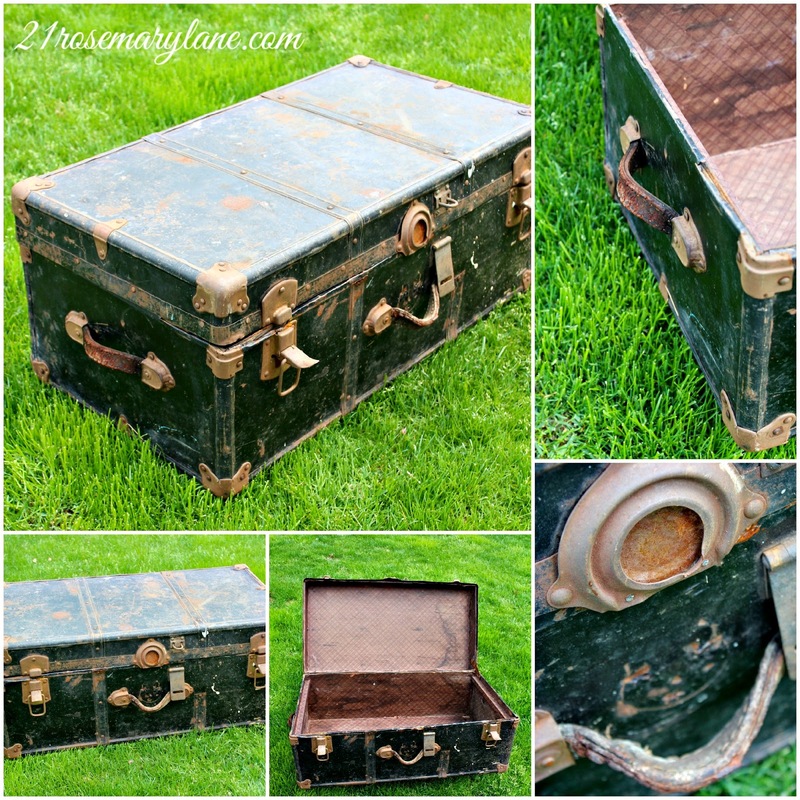 What would you do with an old trunk like this...love to know your thoughts! In the meantime wishing you all a very happy beginning of May and a wonderful weekend!!! As always exciting and inspiring! Can't wait for the next update! Pretty wall color Barbara...can't wait to see more!! Love the idea of adding bamboo shades and drop cloth panels! The room is looking good! I remember when we turned the playroom into an office. Wow! Surprises everywhere! Ha! Beautiful colour choice. Awaiting the next installment. The room is looking good. I love your roadside find too. You are on a roll, it's looking great! Now that is one great find and I agree with Diana, I'd paper in the inside. I'm still not out with an idea for the outside, whatever you do, I'm sure will be clever and perfect! Great find and love the wall color. That paiting is very pretty!